22 lectures (30 minutes each). Disc 4: The wheel of awareness: a model for well-being. Instructors: Shauna Shapiro, Rick Hanson, Kristine Carlson, Juna Mustad, Mike Robbins, Amishi Jha, Elissa Epel, Jessica Graham, Dacher Keltner, Wallace J. Nichols, and Daniel J. Siegel. 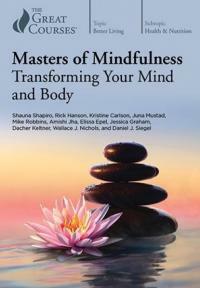 In this course, Shauna Shapiro and 10 of her colleagues will take you on a guided tour of the many ways mindfulness can help you reduce stress and pain, improve your health, increase your happiness, and find meaning in your life. You'll explore both the modern science and the ancient wisdom behind mindfulness, and you'll learn practical techniques to integrate this powerful tool for positive change into your daily routine. Description: 4 videodiscs (approximately 660 min.) : DVD video, sound, color ; 4 3/4 in. + 1 course guidebook (xii, 178 pages : illustrations ; 19 cm).